Are you planning to visit Cagayan de Oro City in the Philippines? 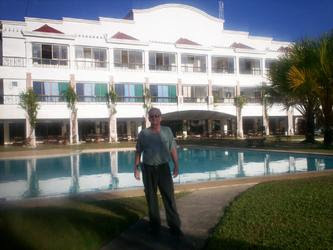 One of the best places to stay is at Xavier Sports and Country Club. This place is just few minutes away from the airport. My husband and I love the accommodation and the privacy of Chalet. The air conditioned room is huge with refrigerator, mini bar, cable TV, hot and cold shower, telephone and high-speed Internet access. Our room has a terrace overlooking the back view of the property. I highly recommend this place. If you need a weekend of privacy, this is the best place for you. The city proper is about 15 minutes away but, one of the biggest malls in the city is just few blocks away. If you love shopping and dining, SM Mall is all you need. Chck out LimKetKai Mall also which is located in the city proper.